Hanita Museum, the Contemporary Art Wing shows the solo exhibition of Michal Ashkenasi entitled "Passages" from December 3 through December 30, 2008. The exhibition is curated by Hana Barak�Engel. Manmade passages, innocent, not manipulated, have been constructed throughout the centuries. Passages between landscapes, passages between buildings � creating bewitched alleys in the ancient cities, the feeling of homes build through the generations. The natural swirl of the land corresponds with the manmade swirl of the buildings. Long gone times have left their impressions on stones, printing them with wrinkles of old age. Giving it all a sense of age old security. 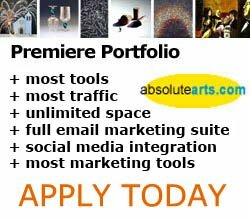 Michal Ashkenasi has been a Premiere Portfolio Artist at absolutearts.com since 2000. The bewitched enchantment of those alleys caught the eye of Michal Ashkenasi and she recorded them in photos full of character, following the swirls with the camera, while she explored the different throughways � doors, windows and little bridges between houses. The withered colors of the old buildings made for monochromatic images wherein only the bright blue sky is the antithesis. The sphere of the photos invite one for a long walk, without worry, through the different places. The composition of the panoramas is almost classica . The artist's choice of specific parts of the wide and abundant scenery is clearheaded and the result is a feeling of wellbeing and closeness to the place. A slight drama drifts in with the images of the clouded skies in beautiful grays; it shows those idyllic surroundings are not always so serene. The journey of the artist in Europe yielded different passages; her own passage from painting to professional photography and the physical passages in the landscape. View more of The bewitched enchantment of those alleys caught the eye of Michal Ashkenasi and she recorded them in photos full of character , following the swirls with the camera , while she explored the different throughways � doors , windows and little bridges between houses . The withered colors of the old buildings made for monochromatic images wherein only the bright blue sky is the antithesis . The sphere of the photos invite one for a long walk , without worry , through the different places . The composition of the panoramas is almost classical . The artist's choice of specific parts of the wide and abundant scenery is clearheaded and the result is a feeling of wellbeing and closeness to the place . A slight drama drifts in with the images of the clouded skies in beautiful grays ; it shows those idyllic surroundings are not always so serene. The journey of the artist in Europe yielded different passages ; her own passage from painting to professional photography and the physical passages in the landscape .